Batteries Included!. 4 Settings - High, Low, Flash, off. Can be used as a headlamp. Can attach to mask strap for hands free use. Can attach to wrist for hands free use. 500 Candle Power. State of the art ultra bright L.E.D. (Light Emitting Diode Technology). Shock and Impact Resistant LED Bulb. Water Proof to 150 ft. Comes with components to use as a headlamp, wrist install or mask strap install. This is for the BLACK version, NOT the silver in the picture. FULL MANUFACTURER´S WARRANTY!!! 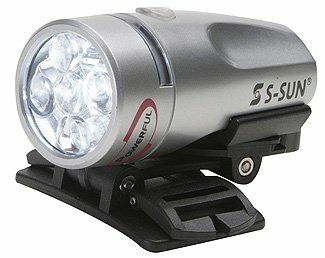 LED This Tilos LED S-Sun light is a fantastic versatile light. Super for all diving needs. AUTHORIZED DEALER = FULL MANUFACTURER´S WARRANTY!!! If you have any questions about this product by Tilos, contact us by completing and submitting the form below. If you are looking for a specif part number, please include it with your message.